Microeconomics, the study of the economic behavior of small economic groups such as firms and families, is one of the largest subfields in economics. The general concern of microeconomics is the efficient allocation of scarce resources between alternative uses but more specifically it involves the determination of price through the optimizing behavior of economic agents, with consumers maximizing utility and firms maximizing profit. 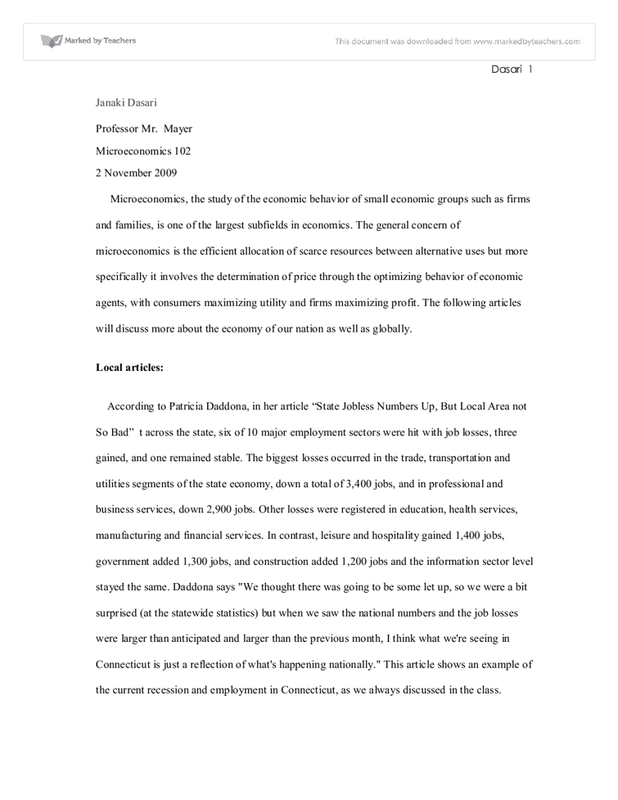 The following articles will discuss more about the economy of our nation as well as globally. According to Patricia Daddona, in her article “State Jobless Numbers Up, But Local Area not So Bad” t across the state, six of 10 major employment sectors were hit with job losses, three gained, and one remained stable. The biggest losses occurred in the trade, transportation and utilities segments of the state economy, down a total of 3,400 jobs, and in professional and business services, down 2,900 jobs. Other losses were registered in education, health services, manufacturing and financial services. In contrast, leisure and hospitality gained 1,400 jobs, government added 1,300 jobs, and construction added 1,200 jobs and the information sector level stayed the same. Daddona says "We thought there was going to be some let up, so we were a bit surprised (at the statewide statistics) but when we saw the national numbers and the job losses were larger than anticipated and larger than the previous month, I think what we're seeing in Connecticut is just a reflection of what's happening nationally." 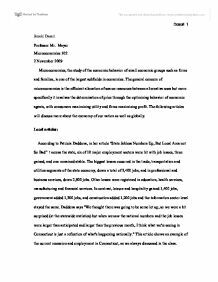 This article shows an example of the current recession and employment in Connecticut, as we always discussed in the class. According to the article “Pfizer Reports 26 Percent Earnings Increase”, Lee Howard states that Pfizer’s earnings are up 26 percent compared to last year. There was revenue of $11.6 billion this year. Over $600 million of the loss could have been blamed for an unwanted foreign currency exchanging on the dollar. This earning happened when it got together with Wyeth, after the report of Pfizer for illegal marketing techniques. Pfizer’s chairman and CEO said that "We are pleased with our results this quarter and in our ability to once again deliver solid operational performance in an environment that continues to be challenging. Excluding foreign exchange, our five Pharmaceutical units and Animal Health business continued to perform well enabling us to continue to meet our commitments.” The buildings located in Groton and New London made an income of $7.9 billion and the diluted earnings per share are 43 cents. According to the article “Some In-State Hospitals May Be Out Of Aetna's Network Beginning Next Year” by Arielle Levin Becker, Hartford Hospital, MidState Medical Center and Windham Hospital might not be a part of Aetna’s as soon as next year, unless they come to an agreement on reimbursement rates. Hartford Healthcare’s senior vice president and chief strategy officer says that “We are hoping for the best and planning for the worst.” They have been planning to separate from Aetna by December 31. Ethan Slavin, the spokesman for Aetna said that ‘It's still very possible for an agreement to be reached between the two sides.’ They are working to find an agreement with Hartford Healthcare. Hartford Healthcare wants a 30 percent rate increase over two years which would be difficult. Other hospitals are going through the whole thing. Bristol Hospital said that it is planning to not be a part of Anthem Blue Cross and Blue Shield unless they come to a compromise. Many hospitals and insurers are fighting to make a commitment to what they both want. According to Eric Gershon, in his article “The Hartford To Pay $1.3 Million To Settle Conspiracy Charges”, says that Richard Blumenthal, an attorney general, said Thursday that The Hartford Financial Services Group will have to pay a $1.3 million fine for a conspiracy that lead to inflated insurance and reinsurance premiums by almost 40 percent. Reinsurance is insurance for insurance companies, often to cover huge claims. Now, this group does not sell reinsurance but is now working with Blumenthal’s investigation against Guy Carpenter & Co that Blumenthal says is ‘the ringleader’ of the conspiracy. This partnership is letting people see ‘a series of illegal price-fixing conspiracies that inflated insurance costs by hundreds of millions of dollars nationwide at the expense of 170 insurance companies and their customers’ Blumenthal is now striving to make sure that he wins this conspiracy. According to an article at Cnn.com, “CBO finds Dem bill with public option reduces deficit”, Deirdre Walsh states that the health care plan that the House Democrats have would cost $871 billion over 10 years. This is less than the $1.1 trillion of the original bill that was passed this summer. It also is under the $900 billion that Obama set to be the highest point. Pelosi is the one who told CBO that this plan was under $900 billion. She is also the one who made the point that it would save a lot of money and would make the House better. She needed 218 votes for the bill to pass and she was close to about 200 people. CBO said that this is not likely. Although, it saves a lot of money, as Pelosi made a point against it. According to his article, “China may push for yuan at Asean”, Saibal Dasgupta states thatChina is hoping to make yuan an international currency. To do this, China is offering to send in almost one-third of the $120 billion economic stimulus package to help out their dependence and Japan is also offering to help. The China-Asean Free Trade Area Agreement will come out on January 1, 2010 and the wide use of renminbi or yuan as the regional currency will take place. Also, China has recently made a bond with RMB in Hong Kong and because of the good progress, Indonesia and Pakistan are also thinking of being a part of it too. China, just last December, tried the currency idea by allowing certain areas to trade in yuan in Asean places. “The upcoming CAFTA, which boasts the largest population among all the world’s FTAs and allows zero-tariff on 90% of products traded between China and Asean, will quicken the process of RMB rationalization," Xu Ningning, executive secretary general of China-Asean Business Council says. According to economist.com in its article “Britain's ongoing recession is the longest and deepest since the war,” Britain’s recession is now the longest lasting, at six quarters. Although it was expected to recover over summer, it declined by 0.4 percent compared to the second quarter. The GDP has fallen 6% from the start in 2008. Although other countries are also receding, Britain is actually going better than some other places like Germany and Japan. But, the Bank of England is almost being forced to prolong its program of easing with the monetary-policy committee. If the bank does not get help, the pound value might weaken. Also, this recession is a big topic in politics. As Britain is revving up for a general election, this problem will be a very important topic for voters because their choice just might save them. Next Year.” The Hartford Courant. The Hartford Courant. 19 Oct. 2009.Web. 22 October 2009. Dasgupta, Saibal. "China May Push For Yuan at Asean." Economictimes.com. Economictimes.com. 21 Oct. 2009. Web. 22 October 2009. Gershon, Eric. "The Hartford To Pay $1.3 Million To Settle Conspiracy Charges." Walsh, Deirdre. "CBO finds Dem bill with public option reduces deficit." CNN.com.CNN.com 18 October 2009. Web. 22 October 2009. "Britain's ongoing recession is the longest and deepest since the war." Economist.com. Economist.com October 2009. Web. 21 Oct. 2009. As it is government funded, the government can choose to spend their money on something else instead of healthcare. Therefore there is an opportunity cost to providing healthcare. The government can may spend the same amount on public structures (roads, streetlights, traffic lights or on education etc). A market economy cannot function in the absence of secure property rights, as there is uncertainty and risk associated with undertaking investments relating to the 'property'. It is risky to build a factory, or make improvements on a farm, if these are located on a piece of land whose ownership has not been legally secured. This was essentially suggesting investing all functions, which were currently invested in the state, in the individual entrepreneur. Smith?s idea behind this was that the invisible hand would find the most efficient outcome for all. For instance, in contrast to allowing government dictated prices he suggested allowing the ?invisible hand?